Today we’ve sprung forward. I think more than me my dog Samantha is excited about the weather staying consistently warm here. I took advantage yesterday by going to brunch (you know where, at Le Pain Quotidien) with my friend Julye and having some girl time. 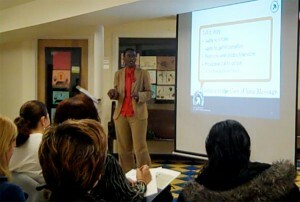 This week I also had another speaking engagement. I spoke to some local entrepreneurs about Words That Sell for Rising Tide Capital, one of my favorite organizations here in my community (second only to my church). One of the keys to their event success is their ability to deliver an exciting Brand Experience over and over again! Imagine if you could identify and create an inviting an unmatched experience for your clients at each and every touchpoint? Repeat business would be delightful and referrals would go through the roof. It’s one of the things that I discuss in my Bankable Branding Bootcamp, and also the topic of today’s article. Also, though it’s definitely a bit techie, today’s brand booster helps you do an inventory of your website so that you can smartly examine which sections of your content need to be updated. Have a great week and keep springing forward!